Are you staging an event you think should be on this page and in one of our rail magazine titles? SATURDAY, APRIL 13 | Bournemouth Railway Club. Winton Methodist Community Centre, Bournemouth BH9 1DE. 14.30. ‘By Rail from Bournemouth to Swanage since 1950’: Alan Trickett. Cornwall Railway Society. Memorial Hall, Methodist Church, Redruth. 18.30. TBA: Dr Les Nixon. GWS. Parish Centre, Church End Rd, Kingskerswell, Torbay TQ12 5LD. 18.30. 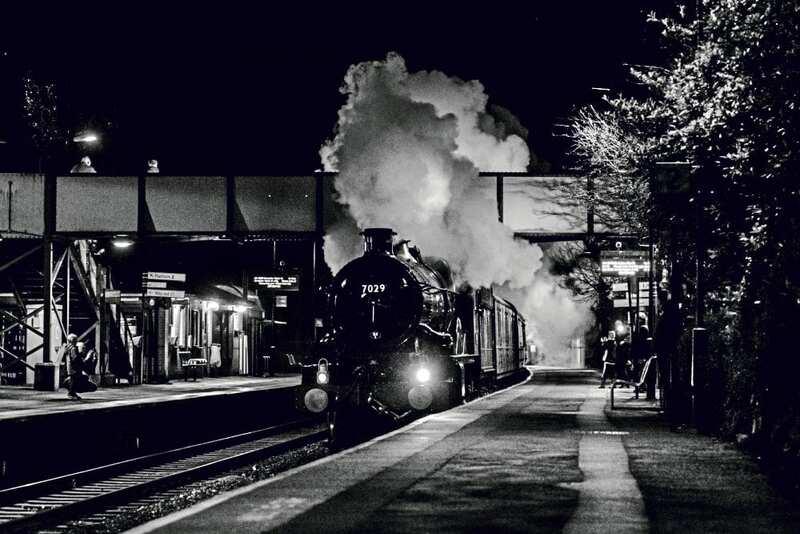 ‘More Steam in the Sixties:’ Alan Reeve. North Eastern Railway Association. Bar Convent, Blossom St, York. 10.30. ‘The Life and Times of a District Motive Power Superintendent’: Richard Barber, and ‘52 Sheds’: David Dunn. 14.00 — ‘The Railways of Nidderdale’: Chris Henderson. RCTS. Conference Room, Great Western Hotel, Exeter St David’s station EX4 4NU. 19.00. ‘Nostalgia from Terry’: Terry Nicholls. SLS. Friends’ Meeting House, Mount St, Manchester M2 5NS. 14.00. ‘British-Built Steam Locos ‘Down Under’’: Dr Michael Bailey. SLS. Kidderminster Railway Museum (adjoining SVR station) DY10 1QX. 14.00. ‘A Presentation on Newly Restored 45596 Bahamas’: John Hillier. MONDAY, APRIL 15 | Plymouth Railway Circle. St Edward’s Church Hall, Home Park Ave, Peverell, Plymouth PL3 4PG. 19.30. ‘Narrow Gauge – Past & Present’: Steven Andrews. RCTS. Town Crier, City Rd/Station Rd, Chester CH1 3AE. 19.30. ‘Steam on the North Wales Coast’: Ron Watson Jones. RCTS. Coventry and North Warwickshire Sports Club, Binley Rd, Coventry CV3 1HB. 14.00. ‘Update on the LMS Patriot Project’: John Hastings-Thomson. RCTS. Didcot Civic Hall, Britwell Rd, Didcot OX11 7JN. 19.30. ‘Pullman Trains’: Matthew Hills. RCTS. Cox Green Community Centre, Highfield Lane, Cox Green, Maidenhead SL6 3AX. 19.30. ‘American Wanderings – Heading West’: Gordon Davies. RCTS. Shenfield Parish Hall, 60 Hutton Rd, Shenfield CM15 8BL. 19.30. ‘An Island Treasure’: Colin Brading. Wensleydale Railway Association (Northallerton branch). Northallerton Cricket Club, Farndale Avenue DL7 8SN. 19.30. ‘A1 Steam Locomotive Trust’. TUESDAY, APRIL 16 | Grimsby & Cleethorpes Railway Group. The No.1, Station Approach, Cleethorpes DN35 8AX. 19.30. ‘The Branch Lines of East Lincolnshire’: Mike Fowler. Leicester Railway Society. The Cricketers, Grace Rd, Leicester LE2 8AD. 19.30. ‘The North East & South West Around 1960’: Peter Groom. RCTS (Northampton branch). The Ashes’ Quiz versus LCGB Bedford (at Bedford). 14.00. RCTS. The Swift, Haggis Gap, Fulbourn, Cambridge CB21 5HD. 19.30. ‘GWR to the End of Steam’: Brian Benford. RCTS. The Black Beauty, Keddington Rd, off Messingham Rd, Scunthorpe DN17 2QH. 19.30. ‘Around East Anglia with a Camera’: John Day. SLS. Langdon Square Community Centre, Coulby Newham, Middlesbrough TS8 0TF. 19.00. ‘The Paris RER’: Michael Bunn (French Railway Society). WEDNESDAY, APRIL 17 | Pennine Railway Society. Club 39, 39 College Rd, Waterdale, Doncaster DN1 3JH. 20.00. ‘Out &About in the UK and Europe 2016-2019’: Robert Pritchard. RCTS/Mid Hants Railway. Eastleigh Railway Institute, Romsey Rd, Eastleigh SO50 9FE. 19.30. ‘Mixed Transport’: Martyn Davies. THURSDAY, APRIL 18 | Aln Valley Railway. Old Waiting Room, Alnwick station. 19.30. ‘Australia’s Fastest Train’: Phil Kirkland of Nexus. Gravesend Railway Enthusiasts’ Society. Emmanuel Baptist Church, 50 Windmill St, Gravesend DA12 1BB. 19.30. ‘The Cutty Sark’: Richard Slater. Lutterworth Railway Society. United Reformed Church, George St, Lutterworth LE17 4EF. 19.30. ‘Nostalgia of Steam’: Chris Pratt. Marlow & District Railway Society. Bourne End Community Centre, Bourne End, BucksSL8 5SX. 19.30. ‘An Eighth Colour-Rail Journey’: Paul Chancellor. Norfolk Railway Society. United Reformed Church Hall, Ipswich Rd, Norwich NR4 6QR. 19.30. ‘From Box Boy to Driver’: Andy Denny. RCTS. Darlington Cricket Club, South Terr, Feethams, Darlington DL1 1SG. 19.00. ‘Steam Everywhere’: David Tillotson. FRIDAY, APRIL 19 | GWS. Village Hall, Stoke St Mary, Taunton TA3 5DE. 19.30. ‘Railways to Royalty:’ Jack Boskett. TUESDAY, APRIL 23 | RCTS. Nottingham Mechanics, 3 North Sherwood St, Nottingham NG1 4EZ. 19.30. ‘O Winston Link and the North & Western Railway’: Bob Gellatly. WEDNESDAY, APRIL 24 | Basingstoke & District Railway Society. Wote St Club, New Rd, Basingstoke RG21 7NG. 19.45. ‘I Moved It My Way’: Andrew Goodman, managing director of Moveright International. RCTS. Council Meeting Room 2, County Hall, West St, Chichester PO19 1RQ. 19.30. ‘London Underground: Then and Now’: Brian Hardy. THURSDAY, APRIL 25 | LCGB (Croydon branch). United Reformed Church Hall, Addiscombe Grove, Croydon CR0 5LP. 19.30. ‘Steam South of the Border in the 1950s and 60s’: David Kelso. Stevenage Locomotive Society. Community Arts Centre, Roaring Meg Retail Park, Stevenage. 19.30. ‘Colour Rail – 1959’: Paul Chancellor. FRIDAY, APRIL 26 | GWS. Pauling Human Sciences Centre, 58 Banbury Rd, Oxford OX2 6QS. 19.30. ‘The LMS Patriot (Unknown Warrior) Project:’ David Bradshaw. Railway Club of the New Forest. McLellan Hall, Lymington Community Centre, Cannon St, Lymington. 19.30. ‘The Severn Railway Bridge Disaster’: Alan Hayward. Shropshire Railway Society. Gateway Education and Arts Centre, Cheshire St, Shrewsbury SY1 1NB. 19.30. Annual meeting followed by ‘5029 Nunney Castle support crew’: Dave Giddins. Slough & Windsor Railway Society. The Manor, Brunel Way, Slough station. 19.45. Spring Railwayana Auction. SATURDAY, APRIL 27 | Tramway & Light Railway Society (East Midlands area). 6th Beeston Scout Hut, Middle St, Beeston, Nottingham NG9 1GA. 14.00. ‘Tramways of the Czech Republic & Slovakia – Part 1: Prague, Plzen and Most-Litvinov’: Robert Pritchard. MONDAY, APRIL 29 | Nantwich & Market Drayton Railway Society. King’s Head Inn, Shrewsbury Rd, Market Drayton TF9 3EH. 20.00. ‘Llangollen Steam Galas 2012-18’: John Slynn. Plymouth Railway Circle. St Edward’s Church Hall, Home Park Ave, Peverell, Plymouth PL3 4PG. 19.30. ‘50 years with Heritage Railways’: Richard Jones. RCTS. Sheffield Scout Headquarters, 60-68 Trippet Lane, Sheffield S1 4EL. 19.00. ‘Tram Operations of SYPTE, Current and Future’: TBA. RCTS. Favell Parish Hall, Booth Lane South, Weston Favell, Northampton. 19.30. Members’ evening. TUESDAY, APRIL 30 | RCTS. Saltaire Methodist Chapel, Saltaire Rd, Shipley BD18 3HJ. 14.00. ‘Closed Stations’: Alan Young. RCTS. Methodist Church, junction of Ludwick Way and Cole Green Lane, Welwyn Garden City AL7 3PN. 14.00. ‘Model Railways’: Michael Watts and Bernard Gudgeon. RCTS. Woking United Reformed Church, White Rose Lane, Woking GU22 7HA. 19.15. TBA. SATURDAY, APRIL 6 | Beacon-Rail 2018 – Tring & District MRC. Pitstone Memorial Hall, Vicarage Road, Pitstone, Tring LU7 9EY. www.tdmrc.co.uk. 10.30-16.30. Adult £3, child £1.50, family (2+2) £7. Refreshments, disabled access. Free parking. Eight layouts from N to G scale — Klapping HO, Porlock OO, Evington St John OO, Vale View O gauge, Royston wharf 009, Brindlecombe N, Lavender Hill N and Alban Rail G Scale, preservation and trade stands. Cambridge Model Railway Exhibition (31A (Cambridge) Model Railway Club). Sawston Village College, New Rd, Sawston, Cambridge, CB22 3BP. 10.00-16.00. Adult £5, child £2, under 5s free. All children must be accompanied by an adult. Working layouts in N and O gauges, club and trade stands, refreshments and disabled access. SATURDAY-SUNDAY, APRIL 6-7 | Cheltenham Model Railway Exhibition. St Margaret’s Hall, Coniston Rd, Hatherley, Cheltenham, GL51 3NU. www.cheltmodrail.org.uk Saturday10.00-17.00; Sunday 10.00-16.00. 12 layouts, trade stands, dioramas, demonstrations. Refreshments, free parking, disabled access. Adult £5, child £2.50, family £10. All profits to the Pied Piper Appeal children’s charity. Nailsea and District Model Railway Exhibition 2019. Nailsea School, Mizzymead Rd, Nailsea, Bristol, BS48 2HJ. Adult £6, Child (5 years to 16 years) £2, Family (2 adults + 2 Children) £14. Opening times: Saturday 10.30am – 5pm, Sunday 10.00am – 4pm. SATURDAY, APRIL 13 | Association of Bexley Charities ’78 Grand Spring Fair. United Reformed Church, Geddes Place, Bexleyheath DA6 7DJ (near Broadway shopping centre). 9.45-13.00. Local charities will be selling items including model railways and collectables. Adult 50p, accompanied children free. SATURDAY-SUNDAY, APRIL 13-14 | Crawley Model Railway Society 30th Annual Exhibition. Tanbridge House School, Guildford Rd, Horsham RH12 1SR. www.crawleymrs.org.uk/exhibition Saturday 10.00-17.00; Sunday 10.00-16.00. 19 layouts, 15 traders, demonstrations, second-hand stand. Free parking, refreshments, fully accessible. Adults £6, children (over 5) £4, family (2+2) £17. Live steam outside. FRIDAY-MONDAY, APRIL 19-22 | Famous Trains Model Railway, Markeaton Park, Derby (nearest postcod is DE22 3BG. www.famoustrains.org.uk/.11.00-16.00. Largest OO-scale model railway in the East Midlands, plus other layouts. Famous Trains also has a shop in the model railway building. Members will give expert advice to visitors. SATURDAY-MONDAY, APRIL 20-22 | York Model Railway Show. Knavesmire Stand, York Racecourse, York YO23 1EX. Saturday and Sunday 10.00-17.00; Monday 10.00-16.30. For discounted advance tickets, go towww.yorkshow.org.uk. 120 stands. Gainsborough Model Railway Society. Florence Terr, Gainsborough, Lincs DN21 IBE. www.gainsboroughmodelrailway.co.uk 13.30-17.30 (opens at 10.30 on Monday). Adult £4, concession and child £3, family £10. SATURDAY, APRIL 27 | Bawdeswell Model Railway Exhibition. Village Hall, Reepham Rd, Bawdeswell, Norfolk NR20 4RU. www.32amrc.co.uk 10am-4pm. Adult £5, concession £4, child £2, family £10. Selection of layouts in O, OO and N gauges. Coventry and Warwickshire O Gauge Modellers’ Open Day. Church of the Holy Cross, St Austel Rd, Wyken, Coventry CV2 5AE. 10.00-15.00. The club’s full test track will be running with demonstrators on various areas of railway modelling, two small layouts, traders, annual coach building competition and a figure painting competitions for the Mike Lee Memorial Trophy. Free entry and parking. Hornby Railway Collectors’ Association 50th Anniversary Show. Warwick Suite, NAEC, Stoneleigh Park, Warwickshire CV8 2LZ. 10.00-17.00. Adult £5, child free. Ten layouts. North West O Gauge Modellers’ Model Railway and Trade Show. Leigh Sports Village, Sale Way, Leigh, Greater Manchester WN7 4JY.10.00-16.00. Ten layouts. Luton Model Railway Club O Gauge Section Exhibition. Flitwick Village Hall, Dunstable Road, Flitwick MK45 1HP. www.lutonmodelrailwayclub.org.uk 10.30-17.00. Adult £5, child £2. O gauge layouts, test track and trade support. Pontypridd Model Railway Club Exhibition. Crown Hill Community Centre, Llantwit Fardre CF38 2NA. 10.00-16.00. Adult £3, accompanied child free. Refreshments, free parking, disabled access. Ten layouts and trade support. SATURDAY-SUNDAY, APRIL 27-28 | Sutton Coldfield Railway Society Model Railway Exhibition. Bishop Walsh School, Wylde Green Rd, Sutton Coldfield B76 1QT. Saturday 10.00-17.00; Sunday 10.00-16.00. Adult £5, concession £4, accompanied child under 16 free. Layouts, trade stands, preservation societies and audio visual presentations. Refreshments, free parking and 14 layouts. West Essex Modelrail 2019. St Edward’s School, London Rd, Romford RM7 9NX. www.iwemrc.org.uk Saturday 10.00-17.00; Sunday 10.00-16.00.Adult £6, concession £5, child £3, family £15. Free parking, 25 layouts, refreshments, trade stands, disabled access. Neepsend Model Railway Society Exhibition. Park Centre, Samson St, Sheffield S2 5QT. www.neepsendmrs.weebly.com Saturday 10.00-17.00, Sunday 10.00-16.30. Adult £5, child £2, family (2+2) £12. 14+ layouts, trade support, demonstrations and refreshments. Epsom Model Railway Show. North East Surrey of Technology (NESCOT), Reigate Road, Ewell, Surrey KT17 3DS. www.eemrc.org.uk Saturday 10.00-17.30, Sunday 10.00-17.00. Adult £7, child under 16 free. Layouts, live steam passenger railway, trade support, societies and refreshments. Free parking and disabled facilities. The show is a 10-minute walk from Ewell East station. Helston and Falmouth Model Railway Club Show. Helston Community College, Church Hill, Helston, Cornwall. Saturday 10.00-17.00; Sunday 10.00-16.00. Adult £5, child £3, family £10. Free parking, 15 layouts, refreshments, trade stands, disabled access. SUNDAY, APRIL 28 | Keighley Model Railway Club’s Spring Open Day. The Clubrooms, Units T1/T3, 3rd floor, Keighley Business Centre, Knowle Mill, South St, Keighley BD21 1SY. 10.00-16.30. Adult £3.50, child £2.50. Layouts in all scales. Refreshments, free parking and lift access. The Model Railway Club Open Day. Keen House, 4 Calshot St, London N1 9DA.11.00-16.00. Four layouts. Yeovil Railway Centre Model Railway Show. Yeovil Railway Centre, Yeovil Junction station, Yeovil, Somerset. Stowmarket Railway Club Model Railway Exhibition. Mid Suffolk Leisure Centre, Gainsborough Road, Stowmarket, Suffolk IP14 1LH. 10.30-16.30. Adult £5,child £2.16 layouts.